Mac Barcode Label Maker - Corporate Edition is useful for generating and printing multiple barcode labels. You can create barcode tags in rectangle or rounded rectangle shape. Program provides various designing tools including text, picture, signature and other objects for designing barcode stickers. Software has facility to copy Barcode Label and paste at specified application including TextEdit, MSWord, MS-Excel etc. Program provides export option to save designed barcode labels. You can send created barcode tags to specified email IDs using advanced email settings. Software allows MAC users to print multiple barcode labels using flexible print settings. Barcode software designed with advanced Barcode system easily works with major Apple Macintosh OS installed machines. Software provides feature to generate multiple barcode labels advanced batch processing series generating options – Sequential Series, Random Series, Constant Value Series. 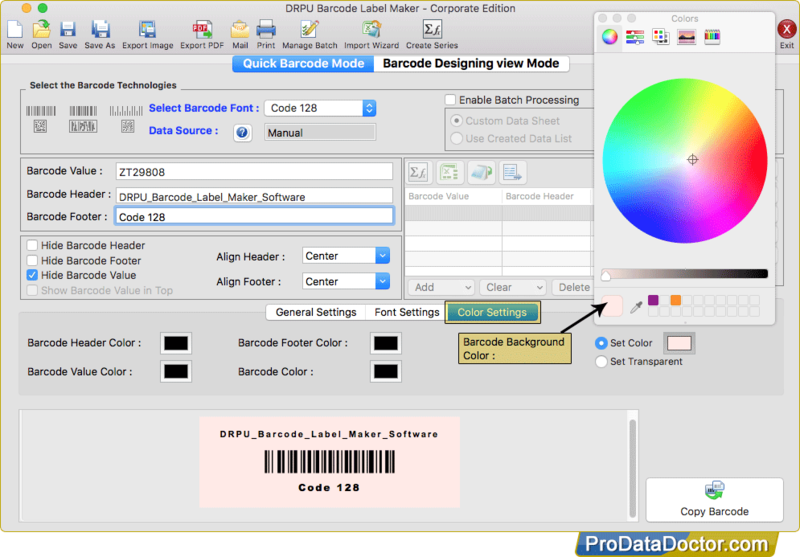 Mac Barcode Software provides print preview functionality to see the preview of barcode labels before printing. Linear Barcode Fonts:- Code 39, Code 128, Code 128 SET A, Code 128 SET B, Code 128 SET C, Codabar, EAN-13, EAN-8, Extended Code 39, Interleaved 2 of 5, Industrial 2 of 5, Modified Plessey, PostNet, Planet, UPCA, UPCE. 2D Barcode Fonts:- QR Code, PDF417, DataMatrix.